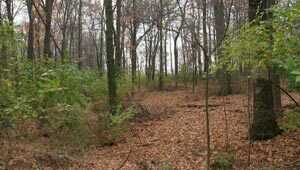 Located in Butler County, Timberman Ridge is a large natural area in the midst of urban development. The Trust for Public Land worked with local partners to protect these 254 acres of former farmland and connect it with the adjacent Forest Run Wildlife Preserve. Completed in 2012, this project helped protect important habitat for native plant and animal species and provide new hiking trails, footpaths, and nature viewing decks for the public.